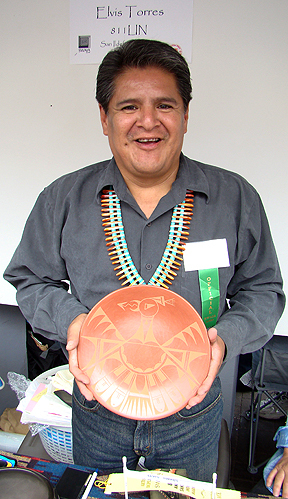 Elvis at the 2007 Indian Market with his award winning plate. 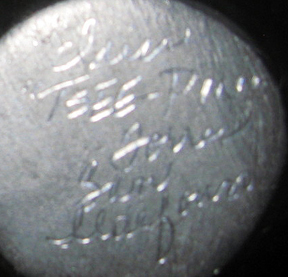 Tsee-Pin Elvis is a sixth generation potter and currently operates the Torres Indian Arts store. He specializes in black-on-black, buff-on-red and polychrome pottery. Elvis’ pottery tradition can be traced back into the 1800s. His great-great-grandmother, Tonita Pena, was famous for her polychrome ware and large storage pots. 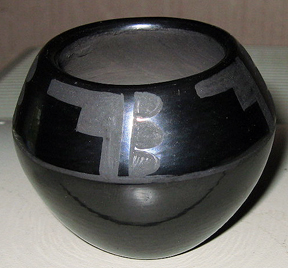 His great-grandmother, Isabel Pena Martinez, mainly created black-on-black with a large amount of her work in carved pottery. Although rare, Isabel’s work can be occasionally found. Before Elvis began working in clay, he painted on canvas and pottery. He painted for Lupita Martinez earlier in his career.